The Midwest is often the one region that confuses the wonderful citizens of the country. While one may consider it an urban area that is flourishing with tall buildings and busy streets, another will only look at it as a place of rolling hills and farms. Nonetheless, regardless of your perception, three young men have found a way to show off style from the middle of the map. 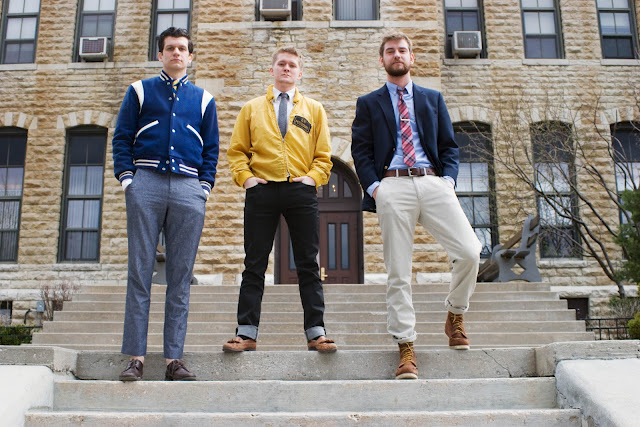 Cam, a student, Seth, a magazine journalist, and Jeff, a salesman, are the creators of The Midwestyle. Each of them is dabbling in all different careers and locations in the Midwest, but their affinity for menswear and style is the one thing they have in common. Although they understand that cities like L.A. and New York get deemed as fashion capitols in the U.S., they have decided to give a fashionable voice to the Midwest, using their blog as a representation. The Midwestyle is more of a resource than an online diary of street-style photos. Instead, they have created helpful sections to ensure that there is a way to accomplish a très chic ensemble in the Midwest. For example, they feature a map that has a list of vintage shops in Chicago, Kansas City and Columbia (MO). Thrifty Thursdays is another feature, in which they create posts that are dedicated to items they’ve snagged at local stores. In addition to these two sections, they also include style posts dedicated to showing men on how to create simple and dapper looks such as how to wear stripes with chambray and how to create a consistent look for spring. We’re pretty sure that the Midwestyle will soon climb to the top of the blog hierarchy and gain the favors of fashionistas everywhere. But for now, be sure to visit their blog, as they bring the Midwest to the forefront one stylish ensemble at a time.